Forces of good and evil clash to determine who will claim victory in the fateful tournament as Warner Bros. Home Entertainment (WBHE) releases Mortal Kombat: Conquest to own on DVD for the first time since the series debuted in national syndication in 1998. Set to release in time for the debut of the franchise’s next entry in the video game series -- Mortal Kombat X – the original series hits shelves for fans old and new alike to relive the action. 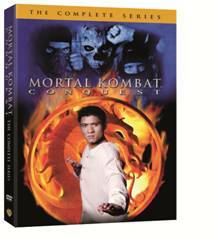 All 22 episodes from the first and only season are included in Mortal Kombat: Conquest, available on DVD for $39.98 SRP on March 31, 2015.